Bike Chick's "ride around town" bike, a venerable Trek of uncertain heritage but vintage ~1986, and veteran of many adventures, has been the recipient of much TLC on my part. First, the pedal threads on one of the crankarms stripped out (while we were out trying to do errands, resulting in a long, one-legged ride home.) Thus I discovered that the left and right crankarms were actually of not only different brands, but different lengths! This led to prompt replacement of the crankset with whatever I had handy, which just happened to be a nice Dura Ace 39x53. The gearing was a little stiff for a town/touring bike, but Bike Chick is strong, and this was what was available at no cost. The new crankset, of course, would not fit on the old bottom-bracket spindle. So the Dura Ace bottom bracket bearings and spindle got installed too. The 'ol Trek was starting to perk up a bit! At some point, I installed fenders. The bike was getting an increasing amount of use in rainy weather, and once Bike Chick got used to keeping her toes from interfering with the front fender, I think she really appreciated the reduced road spray. Soon, Bike Chick mentioned that the front end didn't feel right... the headset was shot, but I had a new-in-the-box Shimano 105 headset in the parts bin... on it went! "The brakes are a little scary" said Bike Chick one day, upon returning from a 25-mile commute ride in the pouring rain. She was right -- the vintage Dia-Compe levers and calipers were never that great when new, and these had seen a lot of neglect. The calipers were sticky, the pads were awful, and she couldn't reach the levers very well. Unfortunately, I think this bike might have started its life with 27" wheels, or else the geometry is just odd; either way, modern calipers (I had some serviceable Shimano 600 dual-pivots in the bin) are too short to work with the 700c wheels. Rebuilding the Dia-Compe calipers helped a lot, and new pads gave a bit more grip. The brakes were better, but still not great. I picked up some of my favorite brake levers, the Cane Creek SCR-5, figuring I'd install them the next time the tape was off the bars. They're available in a "compact" version, to better suit female hands -- personally, I think the shorter reach is nicer for my long-fingered hands too. 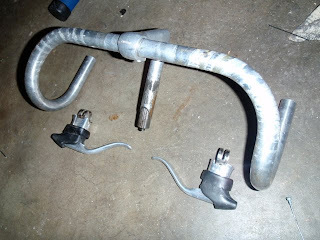 These levers have a great ergonomic hood, and the lever has a nice shape too. Around Christmas, Bike Chick hinted that raising the handlebars might be appreciated. There wasn't time over the holidays to do it, but the task made it onto the list! 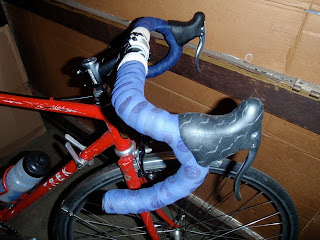 Last weekend, I put a bar and stem from the parts bin onto the bike, just to see how it went. The reach to the brakes was still too long, so we made some measurements, and decided to (gasp!) spring for some brand-new parts. Specialized makes a nice compact bar (both reach and drop are less than the "classic" dimensions, and work especially well for getting the fit right for women) as well as a stem that can have the angle adjusted over a wide range, using shim-collars. I fitted these to the bike and got everything else in the cockpit ready to go (adding new Teflon-coated brake cables to further enhance the weak brakes, and installing the Cane Creek levers.) You can see in the photo that I'm trying out the "Rivendell method" of securing the bar tape with a wrapping of hemp twine. I thought I'd give this a shot, as the tape is a squishy gel-padded type, that doesn't seem to stay put when secured only with a few wraps of electrical tape. We'll see how it holds up -- it's kinda funky looking without suitably retro cloth bar tape, but if it works I'll be happy. After a test ride (up Highway 9, then down Page Mill) Bike Chick reports the bike as "transformed" in its handling! "Well of course," sez I, "it fits you now!" The Trek carries on, happier, I suspect, for being better loved.